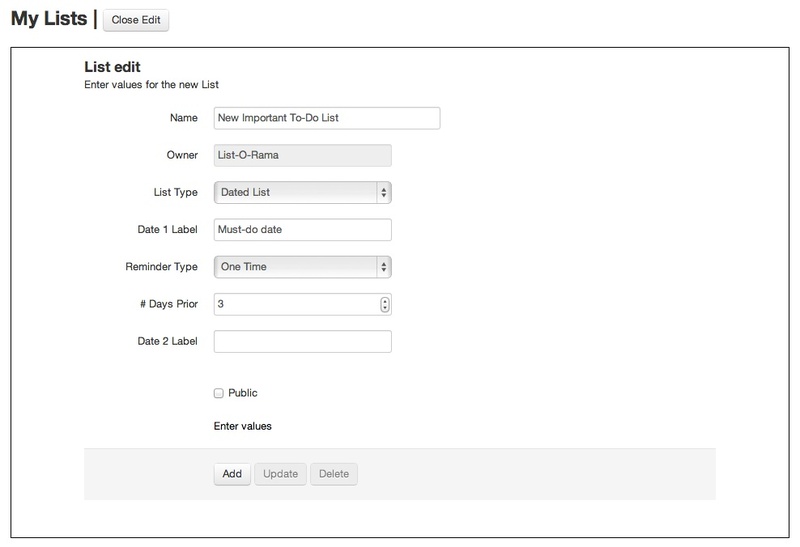 List-O-Rama allows you to create and maintain lists of all sorts. Plus you can take a look at public lists made by other people. ToDo lists, with automatic email reminders! Lists can be ranked or use dates, lists can be made using items from other lists. Please note: if you make a list public, please keep it clean. Lists which generate complaints may be deleted without notice. 2013-May-21: Improved navigation - less clicks! 2013-May-12: Added capability to label the date fields on dated lists. Here's a sample To-Do list, with five items. Each item has a 'Target date' and you can set up the list so you'll get email reminders about upcoming items. How do you create the items? If you click the 'Add a List Item' button shown in the snapshot above, a List Item Edit area will open. Here you can enter the appropriate data for an item. Use 'Add' then 'Clear' to add a bunch of items quickly. By going to My Lists, and clicking 'Create a New List' you can set up the simple rules for the list. 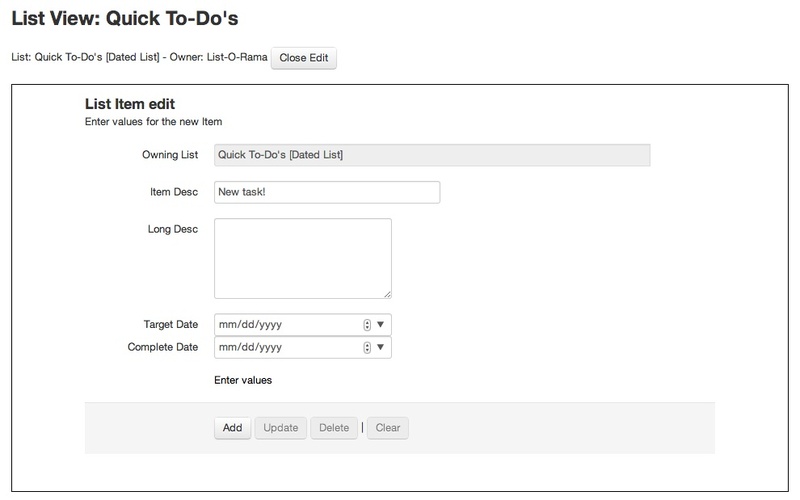 This example shows the setup for a To-Do list, where the date field labels can be set, and the reminder rules. Note that reminders are driven only by the first date, and will stop if the second date is populated on an item. Curt Gardner in Portland, Oregon got it up and running in April 2013.